On Wednesday the Planning Commission will hold their public hearing on the Bicycle Master Plan. It was almost exactly 5 years ago, on October 6, 2009, that Supervisor McKay, at the request of FABB, asked the Board of Supervisors to "endorse the concept" of a bicycle master plan for the county. Shortly after that the county started the first phase of the plan in Tysons. That plan was completed in April 2011. The countywide Bicycle Master Plan was completed in July 2012. It's been a long, slow process but the end of the planning process, and we hope the beginning of a revitalized bicycle program, is in sight. I hope that you can attend the public hearing on Wed. The meeting begins at 8:15 p.m. at the Fairfax County Government Center in the Board Auditorium. There is one case before the bike plan. The public hearing on that case was held earlier so the Planning Commission only needs to make a decision and it could happen quickly. It would be great to have a number of cyclists in the room, not necessarily speaking but showing their support for the plan. I'll be speaking on behalf of FABB and will ask supporters to stand at one point in my testimony. A number of other supporters of the plan have also signed up to speak. If you haven't done so already, please sign our FABB Bicycle Master Plan petition hosted by WABA. FABB and others have worked hard to get to this point. Adoption of the bike plan will ensure that bicyclists "will be treated as valid users of the roadway and accommodated as a necessary element of all roadway improvement projects." On behalf of the Town of Herndon and the residents we serve,I am writing to affirm the town’s support for the Fairfax County Bicycle Master Plan. On August 14, 2012, the Town of Herndon passed a resolution supporting the town’s inclusion in the county’s BicycleMasterPlan,along with several recommendations pertaining to the town. I have attached the 2012 certified resolution to this email for your information. We continue to support a Master Bicycle Plan for Fairfax County and agree with the Plan’s goals and objectives. Providing safe and expansive alternative travel facilities and encouraging more bicycle usage, especially for short trips, are important initiatives for jurisdictions within the metropolitan area. Thank you for allowing us to provide our comments. The Town of Herndon looks forward to working cooperatively with Fairfax County to provide bike and trail facilities that enhance and encourage inter‐jurisdictional connectivity and access to transit. Saturday, Sept. 27, 9:45 a.m. Ride begins and ends in the parking lot near the tennis courts on Brown's Chapel Road. Location: Lake Newport Tennis Courts, 11452 Baron Cameron Ave. This one-hour, 6.2-mile bicycle ride - called Tour d' Art - will be led by members of the Reston Association Board of Directors and the Pedestrian and Bicycling Advisory Committee. It is open to all residents and will feature stops at 12 public art pieces throughout Reston. Please contact Craig Clark at pbac@reston.org to register or for more information. Sunday, September 28, leaving from the Bikes at Vienna parking lot at 8:45 AM. Disaster at sea … a treasure hunt worth millions … a federal fugitive … the X-15 rocket-plane. What links them all to lovely little Herndon? Find the answers at Bikes at Vienna’s second Ride To Discovery along the W&OD Trail! We will cycle from the Bikes at Vienna parking lot to Herndon and back, with a rest-stop at the Herndon Caboose. The route is 17 miles round-trip, all on the W&OD Trail. Please arrive early so that you have time to read and sign the liability waiver and get your bike ready to go promptly at 8:45. Don’t just ride the W&OD. Ride to Discovery with Bikes at Vienna! 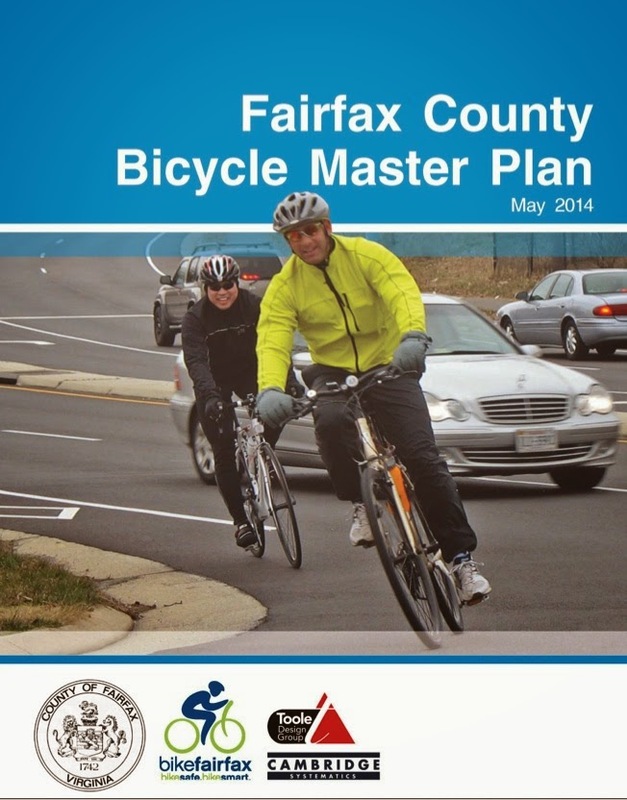 Fairfax County staff have released the Staff Report that contains their analysis of the Bicycle Master Plan which includes the Bicycle Master Plan Attachment, Bicycle Network Map Attachment, and Trails Plan Map Attachment. Public hearings on the plan are scheduled for October 1 before the Planning Commission and October 28 before the Board of Supervisors. Adoption of this first-ever bike plan will be a major milestone for cycling in Fairfax. We are encouraging all residents to sign the FABB Bicycle Master Plan petition and to attend the public hearings. The bicycle facility and policy recommendations included in this Comprehensive Plan amendment represent a shift in how bicycle planning and design will be approached in Fairfax County. Moving forward, it is assumed and expected that bicycles will be treated as valid users of the roadway and accommodated as a necessary element of all roadway improvement projects. Private and public development along roads included within the Countywide Bicycle Network will be expected to contribute to the vision of a place that meets the needs of bicyclists today while encouraging more people to ride in the future. This expectation is fully consistent with direction established in the county’s adopted Transportation element of the Policy Plan, VDOT’s Statewide Bicycle Policy Plan, and other local, regional, state, and national documents. The information in the Fairfax County Bicycle Master Plan provides direction and guidance on how to implement policies already established and adopted at the highest levels of Fairfax County and VDOT. Monday, September 22 is Car Free Day. 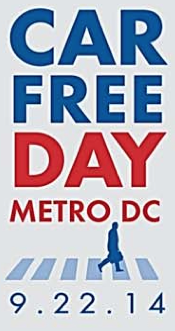 Many of us are already mostly car free, so why not take the Car Free Day Pledge and be eligible to win a yearly CaBi membership, a Sole bike, a Bicycle SPACE gift certificate, and other prizes. FABB will have a special guest at our September meeting on Wednesday. Vanessa Aguayo of Fairfax County DOT will give a presentation on bike projects she is managing. They include a bridge over Wiehle Ave on the W&OD Trail and Vesper Trail in Tysons that will connected the northern Vienna area to the Spring Hill Metro station. We will also be discussing the upcoming public hearings on the Bicycle Master Plan. The Planning Commission public hearing is scheduled for Wed. Oct. 1 starting at 8:15 p.m. The Board of Supervisors public hearing is scheduled for Tuesday, Oct. 28. The FABB meeting starts at 7:30 p.m. at Patrick Henry Library, 101 Maple Ave E, Vienna (map), located a block from the W&OD Trail. Everyone is welcome. To learn more about the Fairfax County Bicycle Master Plan (Phase II), a public information meeting is planned for Monday, September 15 from 7:30-9pm at the Mount Vernon Government Center Community Room (map). Public hearings on the plan are scheduled before the Planning Commission (October 1) and Board of Supervisors (October 28). We are asking all cyclists to support the plan by signing the FABB Bicycle Master Plan petition and attending the public hearings. It would be great to have a large contingent of cyclists at the public hearings to show our support for the plan. Maybe we should all wear our bike helmets into the hearing. See our earlier blog entry about Monday's meeting. Northern Virginia Cycle Fest is this Sunday. Cycle Fest is a series of mostly on-road rides in Fairfax and Arlington Counties. Four ride options, departing at 7:30 a.m., range from 11 to 62 miles. All rides originate and return to the Jewish Community Center of Northern Virginia, 8900 Little River Turnpike. The rides are designed to be fun and challenging for riders of all levels and experience - with a suggested minimum age of 12. FABB will have an information table at the event. Riders should be comfortable riding on roads with traffic. All ride options have rest stops, SAG vehicles, mechanical support, merchant sponsorship and light refreshments. The 2014 ride benefits Wounded Warriors Project and Washington Area Bicyclist Association (WABA). For more information, visit the Northern Virginia Cycle Fest website. Fee: $50/$45 JCCNV members/$20 active military and first responders. We've heard that bicycle parking at the McLean Metro station regularly fills up by 9 a.m. most days. There is room for 26 bikes on both sides of Route 123 and the racks on the south/east side are the ones that fill up. Those on the north/west side are difficult to reach and there are few residents on that side of 123 to use the racks. Martin DiCaro of WUSA9 TV interviewed Navid Roshan-Afshar of The Tysons Corner and me to discuss bike and auto parking at the McLean station. See his story Bike parking shortage along Silver Line. The 700 space private lot is mostly empty. The good news is that WMATA plans to add more bike parking in the near future. Update: See the PlanItMetro blog entry about adding more bike parking at the McLean station. Countywide Bicycle Master Plan will soon be considered by the Board of Supervisors. The Planning Commission will hold a public hearing on October 1 and the Board of Supervisors will hold a public hearing on October 28. To learn more about the plan, the second of three countywide public meetings is scheduled for September 15 at Mt. Vernon Government Center, 2511 Parkers Ln, Alexandria, VA 22306. Visit the county bike plan webpage for links to the "Fairfax County Bicycle Master Plan - Final Draft" and the four "Maps of Recommended Bicycle Network." We encourage all Fairfax cyclists to consider attending the October 1 and 28 public hearings. See the FABB blog for details as we get closer to those dates. After a series of public meetings over the past year, Fairfax County identified a long list of high priority transportation projects. Funding for road and transit projects will come from money allocated by the Commonwealth of Virginia. After deciding that most pedestrian and bicycle projects were not eligible for those state funds, the county plans to fund those projects using the 2014 Transportation Bond. While most are pedestrian projects such as new sidewalks, several important bike projects are included. We strongly support the Bond and encourage all county residents to vote YES on November 4 to improve pedestrian and bicycle access. See the list of all projects that will be implemented if the Bond passes. Northern Virginia Cycle Fest is a series of mostly on-road rides in Fairfax and Arlington Counties. The event will be held on Sunday, September 14. Four ride options, departing at 7:30 a.m., range from 11 to 62 miles. All rides originate and return to the Jewish Community Center of Northern Virginia, 8900 Little River Turnpike. The rides are designed to be fun and challenging for riders of all levels and experience - with a suggested minimum age of 12. FABB will have an information table at the event. VDOT is completing bike lanes on Sherwood Hall Lane as part of a repaving/pavement marking project to improve safety. Bike lanes were added in both directions from Fordson Road to Fort Hunt Road, about 1.5 miles. As the street is not wide enough for bike lanes in the one-block, 450-foot segment from Holland Road to Parkers Lane, shared-lane markings, known as "sharrows," were installed to let cyclists and motorists know that bikes will share the travel lane with motorists. Thanks to Supervisor Hyland and Delegate Surovell for supporting the project and to Fairfax County and VDOT staff for their work on the project. The newly configured road will benefit all users by making it safer and providing a dedicated bike facility. Fairfax County Schools resumed classes on Tuesday, September 2. Drivers who have been commuting past empty schools all summer will face a plethora of walkers/bikers/buses and additional cars on their normal commute. The best advice to drivers is to simply slow down and enjoy watching all the kids make their way to school for another year of learning. Students and parents also need to be reminded to be safe. If walking, cross at intersections and look both ways before crossing. If riding, wear a helmet, ride with traffic and signal your intentions. Some advice from our Police Department: Back to School Safety Reminders. We hope this year in FCPS will show a marked increase in schools participating in Safe Routes to School (SRTS) Programs. Some dates to remember: September 15-19 is VDOT's Student Tally Week, October 8 is International Walk to School Day and October 28 is the Greater Washington DC SRTS Regional meeting. The National SRTS Partnership is also looking for feedback about the types of services and support you need in your work to advance Safe Routes to School. Please take the SRTS Survey. Lastly, here is a good article from our UK brethren: Pedal Power: Why Cycling to School is Good for Learning and the Planet. And here is a nice school-related graphic from our friends in Arlington. FABB has been doing midday counts of bikes parked at the Wiehle-Reston East Metro station since the station opened. There are 10 U racks at the south station entrance, with a capacity of 20 bikes. On the north side there are 16 U racks outside the bike room that hold 32 bikes. There is no charge to park at those racks located under cover. The secure bike room can hold over 200 bikes. Below is a chart of counts from July 31 to August 28. Over time the number of bikes has gradually increased from a low of 61 on the second count to a high on August 28 of 107. If you compare the high number with the 2013 Metrorail bike parking census conducted by WMATA, the Wiehle station would rank 3rd in the category "Top Stations for Total Bikes Parked". The free racks outside the bike room were over capacity (bikes locked to the fencing) 6 of the 10 days. An average of 13 bikes (of 20 capacity) were parked at the south racks, so there was usually a place to park. The bike room was at about 1/4 capacity with plenty of room for more bikes for those who pay the $60 annual fee (approximately 25 cents/day for daily commuters). The second of three planned meetings on the Bicycle Master Plan is scheduled for September 15 from 7:30-9pm at the Mount Vernon Government Center Community Room (map). Cyclists are encouraged to attend the meeting to learn more about the plan as the county prepares for public hearings before the Planning Commission (currently scheduled for October 1) and Board of Supervisors (Oct. 28). The Mt. Vernon center is located on Parkers Lane, which intersects with Sherwood Hall Lane where bike lanes were recently striped. Why not arrive early and check out the new bike lanes? See our report from the earlier Bicycle Master Plan meeting held in Reston (which was combined with the Reston bikeshare feasibility study meeting). Late last month, the City's Capital Bikeshare network doubled. The addition of eight new stations in Del Ray and Carlyle showcases the bike sharing public/private partnership that now counts the District of Columbia, Arlington, Montgomery County and Alexandria as members. The expansion did not come without a full performance review of the existing system, which was originally installed in the Fall of 2012. The City's Capital Bikeshare system was originally funded using Federal Congestion Mitigation and Air Quality (CMAQ) funds. The CMAQ funds now purchase new stations, while the City's Transportation Improvement Program (TIP) now fund operations for existing stations. Public transportation systems of all kinds depend on heavy public subsidies. In Alexandria, the DASH Bus system recovers approximately 30% of its costs from fare box revenue. Original estimates of Capital Bikeshare's performance were expected to be similar. Surprisingly, Alexandria's cost recovery in the first year reached 72% from rentals. The system has provided a critical, low-cost connectivity option for short trips, used frequently by our residents and visitors alike. Current plans will allow continued expansion over the next few years. Please use this link to suggest station locations. *The Reston bikeshare feasibility study was completed on June 30 but no information is available on the county's Bike Pages site. The county is extremely slow in updating the site. The last bikeshare meeting was held on June 25 but according to the Bike Pages site, an open house will be held January 29. Other old news includes an upcoming VDOT meeting on June 11 and a May Bike to Work Day announcement. There is no information about an upcoming Bicycle Master Plan meeting scheduled for September 15 or about the upcoming public hearings on the Bicycle Master Plan. The county can do better than that. Update: We've heard good news from county staff that they are making a concerted effort to update the Bike Pages site, including posting the Reston bikeshare report in the near future.